Our ancestors adapted strong hind legs allowing them to travel great distances. They also had a greater cognitive capacity allowing them to find new purposes for common objects as well as develop a method of communication. In some cases, the repurposed objects acted as weapons and the communication gave our ancestors a strategic advantage over their prey. In other cases, those objects acted as tools to help build or carry and communication served as a method to divide the labor in order to accomplish more as a group. The droughts that hit Africa, due to the rearranged ocean currents, meant that food was not very plentiful around that region. Our ancestors didn’t give up, life never does! They traveled out of Africa, finding a way to manipulate their environment to suit their needs on the way. For example, those that traveled to colder climates in the North utilized the skin and fur of the local prey, who had adapted over generations to survive in the cold. We were able to take advantage of other organisms’ adaptations and use them for our own benefit. Walking across a planet, as you can probably imagine, takes some time. Many generations of our ancestors would live and die before they reached the farthest corners of the globe. In that time, adaptation could cause subtle differences to form among those early humans. The most noticeable change was the amount of melanin present in their skin. Melanin is a protein that absorbs light to reduce the amount of damage done to the organism’s DNA from high-energy photons. In the savannas of Africa, near the equator, there is almost constant sunlight so our ancestors’ cells allocated more resources toward making melanin giving them a better chance of survival. The individuals that moved away from the equator, specifically northward, did not experience as much sunlight. Allocating resources to making melanin was not as advantageous among these ancestors. The skin tone of our diversifying ancestors changed over generations. Some of the ancestors adapted a skin color that resembled the environment, a sort of camouflage that made hunting more successful. The melanin production drastically decreased among ancestors living closer to the poles. Decreased melanin was caused partly by resource reallocation, a need to absorb more scarce sunlight, as well as social trends to find lighter skinned ancestors more attractive. This is why we see each other as different races; too many generations in different regions of the planet have made us forget our common ancestry. Think about all the strife that has been caused because of a protein in an organ that’s already mostly dead. Early humans adapted the ability to walk for long periods of time and if nature teaches anything, it is to exploit your adaptations as much as possible. The stationary life just didn’t cut it. Prey migrated in herds, plants only bore fruit at specific times of the year, there wasn’t enough consistency for a stagnant lifestyle to win out over a nomadic one. Some early human groups found their way to river valleys, diffused rivers that spread water over a large area of land, allowing for an abundance of life. To a group of nomadic humans, an abundance of life meant an abundance of food. Our ancestors were able to expect a constant food source so they were willing to build more permanent shelters, knowing they wouldn’t have to abandon or carry them. Eventually, a few individuals were able to link the causality between the seeds of a plant and the plant itself. They discovered that if they spread seeds near their shelters, plants would grow. Agriculture was born! With a steady food source and protective shelters from hungry animals, the population of humans could increase to much greater sizes than our hunter-gathering ancestors. 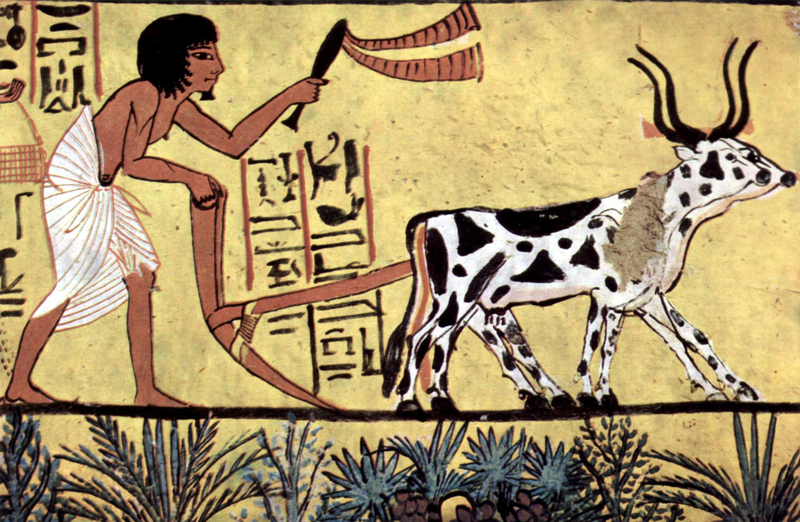 More humans meant more work could get done but agriculture allowed for much of the food gathering work to be done by just a few individuals. Most of the labor was still farming related, but the humans that weren’t needed on farms were free to create new things that could be used or traded within the growing society. The process of settling and using farming to gather food is one that was repeated among many pockets of humans around the planet. The exact story changes when you look at each pocket but most of them followed a similar trend. There are, however, tribes of humans that still practice hunter-gathering lifestyles to this day! This is just another example of how evolution does not mean that an entire species shifts a specific way. Some individuals will continue doing what works while others explore new niches. Our early human ancestors settled the land, expanding and developing new technologies based on their needs. The inherent selfishness of humans mixed with the limited nature of resources caused humans from separate settlements to compete for those resources. The competitive strategy was pretty basic: kill the others until they stop fighting back. A trend of societies advancing technologically, growing to conquer, and inevitably falling to another group would repeat itself in many different stories throughout recorded history. Settlements of humans found ways to connect but each settlement built up their own culture. While each settlement devised a method of fulfilling the same purposes of a society, they reached that method in different ways. When humans from different societies met, there were often wonderful exchanges of ideas and both sides could benefit. Among some groups, differing ideas could not be set aside; this was usually the case when it came to spiritual views. The logic is simple: if I believe in a god that’s different than yours and you say that yours is right, you must be implying that mine is wrong. 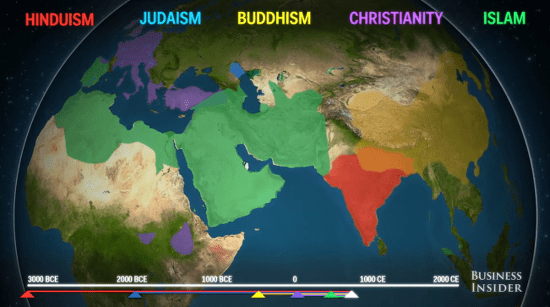 History gives us a clear view of how our ancestors settled their perceived differences.